Introduction : Systems & Processes – Business Report With APA Referencing Style. Provide APA references for each question and provide a Bibliography/ Reading List of ALL references at the end of your assignment. Reference Internet sources to define plagiarism. Is collusion on assignments plagiarism? Why is plagiarism/collusion unfair to honest students? Use Green shot getgreenshot.org/ to copy and paste in a Word file, a simple normal view AND formula view of a spreadsheet showing row and column headings. Describe ONE other method to paste a spreadsheet in a Word file. Refer to the Spreadsheet Advice PDF for examples. List six web sites relevant to accounting together with their URLs. Explain how is each relevant to accounting. Find online one Australian professional accounting organisation. Describe a resource within this website (apart from ABC Learning), potentially relevant to your study of accounting. Explain why you chose this resource. Q5 Work Integrated Assessment (5 marks) (about 300 words). Describe the computing environment in your current or previous workplace or home office; equipment, software, processes etc. Or answer this question in relation to a possible future workplace position. The above five questions are designed to assess your ability to use and evaluate digital resources for accounting and can be answered from any source including the computer sections of magazines and newspapers or by access to the Internet. When using the Internet include the URL reference. Watch the six CPA ABC Learning movies. What did you learn from watching these videos? 2. What are the major financial reports? What is the purpose of each? 3. Identify 3 ethical issues from the case study. 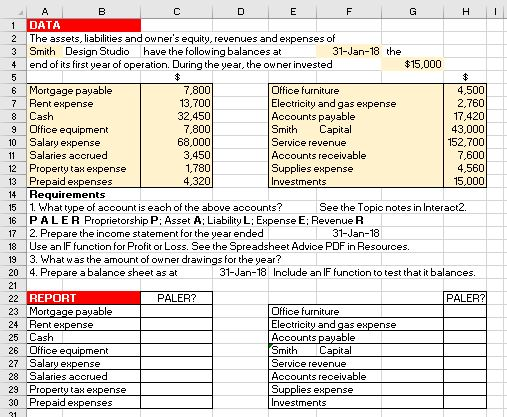 Spreadsheet – check the assignment and spreadsheet requirements. Explain P A L E R. Refer to the Topic notes. Create a manual, handwritten solution. Scan or use your phone to copy and paste an image of your handwritten solution in your word file. If using a smart phone, consider using a free scanning app such as Camscanner, Office Lens or Google Drive or search for an app. Let us know which method you chose. We ask for a handwritten solution because this is the method you will use in the final exam. In the meantime, we want you to acquire spreadsheeting skills. 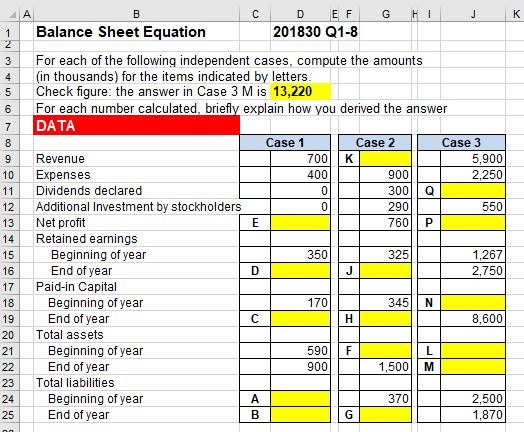 Create a spreadsheet solution. Check the spreadsheet requirements in the Subject Outline. Create a manual, handwritten solution. Scan or use your phone to copy and paste an image in your assignment. If using a smart phone, consider using a free scanning app such as Cam scanner, Office Lens or Google Drive or search for an app. Let us know which method you chose. Spreadsheet required. Note: Interact2 resources including the Spreadsheet Advice PDF and the worksheet video may assist in completing this assignment question. In this case, the Report section will look just like the data section but will contain only formulas. In some cases, the cells in the report will be, for example =D8. The yellow highlighted cells will contain the answers. C.For each number calculated, briefly explain how you derived the answer.